Zahida Begum has been a refugee herself since her mother smuggled her as a year-and-a-half-old across the Naf river into Bangladesh on a fishing boat. She doesn’t remember anything about her native village Laba Daung in Myanmar. However, now aged 28, she has never forgotten her roots. On September 27, Begum received a frantic phone call from her relatives in her country of birth. They informed her that the military had begun burning their village, and many people had been shot and killed as they tried to escape into the mountainous forest on foot. “As people were getting killed, I told them to slowly make their way to the river bank,” she recalled. “When they arrived near the river bank, I called my brother-in-law, who lives abroad, and told him our brothers and sisters have arrived near the river, and asked him how we can bring them across to Bangladesh” she added. With help from her brother-in-law in Australia, and another relative in Malaysia, Begum was able to raise more than 4,000 US dollars in a matter of hours. She then immediately contacted a fisherman in the coastal village of Shamlapur, close to her home in the congested Kutupalong refugee camp. For the next 12 days, Begum kept the newly arrived refugees in and around her bamboo-and-tarp shelter, and fed them rice and lentils. On the 12th day, she gave each family an additional 3,000 taka (36 US dollars) and sent them to another camp nearby, to build their own shelters. Abdul Matlab, aged 35, was one of the 400 people Begum helped rescue that night. He now lives with his extended family in the 8 by 14 feet (2.5 by 4.2 metre) shelter that has some basic cooking utensils and firewood. They sleep huddled together on the tarped floor. One the day they had to flee from their native village of Sou Fran in Myanmar, Matlab said soldiers from the Myanmar military came into the village, surrounded it, and started firing indiscriminately. “We have gone through a lot of misery to come here,” Matlab said. She works as a translator and educator for Human Rights Watch, and has helped refugees seek medical attention, and spread awareness about sanitation, childcare, and women’s health in the camps. Though she was happy to have helped saved lives, Begum said she is aghast by the condition of people crossing over from Myanmar. Sometimes, she wonders if their faith is the only reason for the persecution. “How can we Muslims be at peace after seeing all this? Where is our peace? All we are looking for is peace. Why can’t we attain this peace? Is all this just because we are Muslims? Will we get peace if we change our faith?” she said. 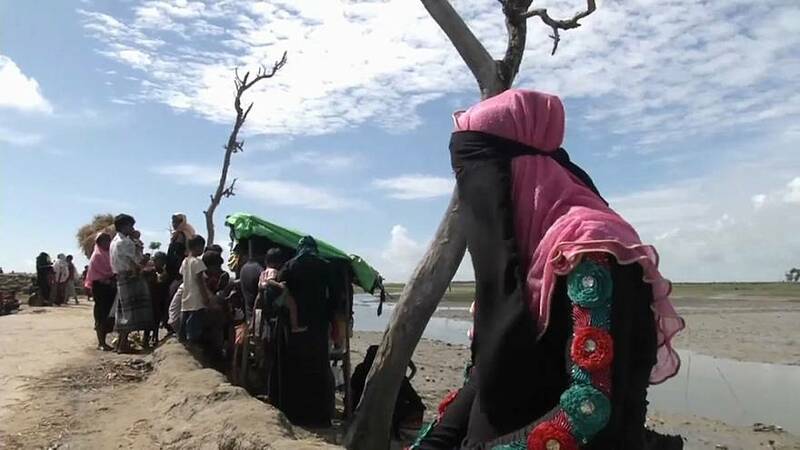 While appeals for the safe return of Rohingya to their villages in Myanmar have come from different parts of the world, the size of the refugee camps in southern Bangladesh continues to increase.